The Oscars are Hollywood’s glitziest and most exclusive star-studded event, but the very first ceremony in 1929 was a private affair held at the Hollywood Roosevelt Hotel – and a ticket cost just $5. Everyone knows the statuette as “Oscar,” but it actually has an official name: Academy Award of Merit. So how did it get to be called Oscar? According to the Academy, the origin story can’t be confirmed, but it’s widely believed that the trophy received its nickname from Academy librarian Margaret Herrick, who said that the little gold man looked like her Uncle Oscar. 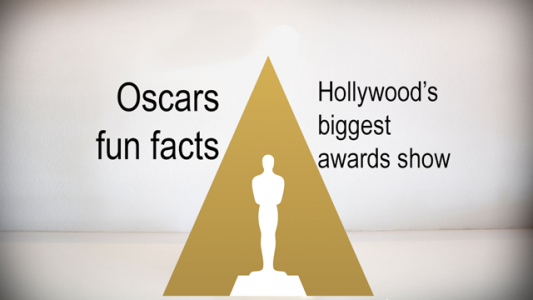 Prior to the Oscars, rehearsals are held where celebs show up to practice their lines, announce the winner and present an award. For the past 14 years, the Dolby Theater in Los Angeles has hosted the Academy Awards, which seats 3,400 people. All of them will walk the show’s red carpet to reach the venue, which stretches a whopping 500 feet (beating out the Golden Globes’ red carpet, which extends to around 437 feet). To spotlight the event’s long-running history, the red carpet is flanked by two pillars that bear the name of every Best Picture winner since the show’s inception. Incredibly, there’s enough room for the Academy to keep adding winners through 2071. 5. Want to be a seat filler? Too bad! The only way for a regular Joe to score a seat to the Oscars is to work as a seat filler. But even then, he or she can’t be that “regular”: According to a seat-filler who worked at the 2003 show, the only way to score the (unpaid) gig is to know someone who works at the Academy or to be an employee of PricewaterhouseCoopers, the accounting firm entrusted with tallying the votes. Legendary entertainer Bob Hope holds the record for hosting the most Academy Awards, having emceed 19 ceremonies between 1940 and 1978. Hope began hosting prior to when the show was televised, and closed out his run on Oscar’s 50th anniversary. On the opposite spectrum, this year’s host Jimmy Kimmel hopes to avoid the One and Done Club, the celebs who haven’t been asked back to host after their first time. Stars who have membership in this dubious club include Chris Rock, Seth MacFarlane, Anne Hathaway, James Franco and “Crocodile Dundee” star Paul Hogan. In the early days, the Academy kept a lid on the results, making an exception for newspapers so that that they could publish the list of winners at 11 p.m. on the night of the event. Then The Los Angeles Times published the results in advance of the 1940 awards show, spoiling the winners before the ceremony got underway. The Academy responded the following year by sealing the results in envelopes, with their content kept secret until they are opened on stage. When someone wins an Academy Award for the first time, the winner usually comments on heavy the statuette feels. There’s a reason for this: It stands at 13.5 inches and weighs 8.5 pounds. To give some perspective, clutching an Oscar feels like holding a gallon of milk.